I have a new story out - right now! It's called, "Surveyor of Mars," and it appears in in DAW's new Westward Weird [Amazon|Powell's] anthology, edited by Kerrie Hughes and Martin Greenberg. My story is about a land surveyor - who is also a reluctant gunfighter - working on Mars who gets drawn into larger and less-pleasant events that will shape the future of the pioneer world. Gunfighters, Buffalo Soldiers, pioneers, a habitable Mars that never was but maybe could have been: I plan to work more within this setting! By the way, my icon for this post comes from Antoniadi's map of Mars as he and Lowell saw it through the imperfect optics circa the time of this story. Inspiration came from Wells' War of the Worlds; Percival Lowell's Mars as the Abode of Life and Mars and Its Canals to get a feel for how people thought of Mars at the time; and Jonathan Raban's Bad Land, a wonderful look at the plight of the pioneers who settled northeast Montana, aka "The Great American Desert." 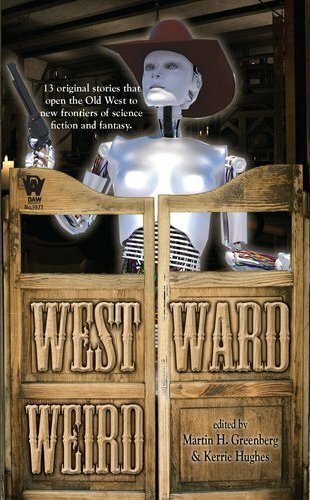 Do you like the Old West, alternate history, and the supernatural? Then you should LOVE this book - and, I hope, my story, too! I encountered some of the bots in this article when I bought your book. It's interesting to see what happens when they interact with Amazon and each other.